We are members of Golden Lampstand Church in Linfen, Shanxi Province. 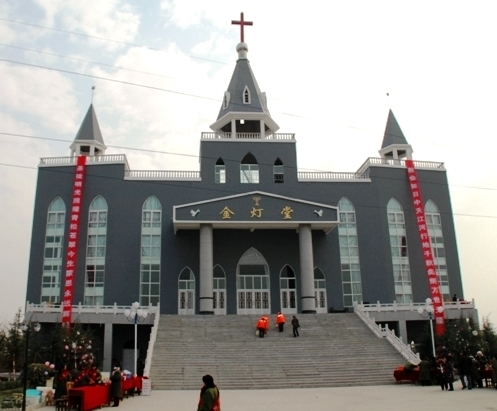 On September 24, 2009, a group of Public Security thugs laid siege through the night on Golden Lampstand Church of Linfen, then launched a surprise dawn attack. After they beat people up, smashed things and robbed the church, dozens of church leaders were illegally detained, believers were savagely beaten and driven out, and dozens of lay leaders were jailed and the church was robbed clean. Since the fall of the Golden Lampstand Church of Linfen into government hands, it has been sealed off nearly four years. Currently, Golden Lampstand Church of Linfen is still sealed up by the government, with Public Security officers standing guard. Seen from the outside, the church's doors and windows are all broken, everything looks bleak, ruined and devastated and the courtyard is filled with trash and weeds. The scene left from the beating, smashing and robbing is still shocking. After the Golden Lampstand Church was illegally sealed up, the believers were scattered and adrift, unable to live a normal spiritual life. They had to break into small groups and gathered separately in unoccupied homes, outdoor spaces and wild fields in the outskirts of town. Again, they were harassed and assaulted by Public Security officers and on many occasions had to move to another place. In addition to the persecution, the environment for the gatherings is very bad, too. In spring, there were dust storms; in summer, scorching sun and storms; in the fall, cold rain and mosquitoes and bugs; and in winter, snow and extreme coldness. At Christmas, Easter and Pentecost, they were forced to gather in the deserted and cold wild outdoors. Furthermore, cults and heretics such as “Eastern Lightning” took advantage of the situation and gobbled up our believers, harming the church. Moreover, criminals intimidated and offered inducements to our believers, adding fuel to the fire for Linfen. The believers prayed without ceasing and in tears before God, asking when they could go back to the Golden Lampstand Church! In the beginning, when they tried to build the Golden Lampstand Church, the church faced a huge shortfall in construction funds. So, other than "the widows two coppers" donated by believers emptying out their pockets, most of the construction costs were covered by funds borrowed from friends and family of the believers. 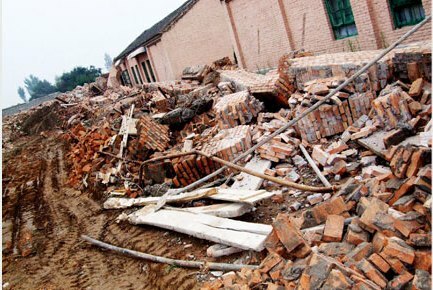 Now that the Golden Lampstand Church of Linfen has fallen into the government's hands and offerings from believers have stopped and the church leaders have been illegally sentenced, repayment of the borrowed funds is out of the question. Recently, as the church leaders have been released from prisons and labor camps (all with illnesses and injuries), they are weighed down once again by the huge debt, and creditors are constantly harassing them. The church leaders are cornered: repaying the debt is not only urgent, but also long-standing problem, the resolution of which is tied to the fundamental issue of getting back the Golden Lampstand Church, for which we lift up our prayers. The related Sept. 13 Fushan case has also been left unresolved for a long time. The church has been reduced to broken walls and debris, and the church property has all been stolen. The believers have scattered and left, and the debt borrowed to build the church is also unpaid. The clause of the Constitution that endows citizens with religious freedom is a useless scrap of paper that has been arbitrarily trampled on—how can there be any talk of human rights? Sister Yang Rongli (photo at right) was illegally sentenced. Halfway through her sentence, she began to be treated as a political prisoner and was illegally deprived of her qualification for commutation of her sentence. She still has three and a half years of her sentence left. She has diabetes and hepatitis and the medical facilities in the prison are severely limited. From the start of her sentence to now, her health has steadily worsened and brothers and sisters are very worried about the health of Yang Rongli. The only thing they can do is praying without ceasing in the hope that God will open a way for her, so that she can be peacefully released from prison as soon as possible. Sister Yang Rongli’s parents-in-law are already in their 90s and she doesn’t have a daughter [to take care of them]. Before the incident, Sister Yang Rongli performed her filial duties for her parents-in-law while also in full-time service to the Lord. The parents-in-law enjoyed the happiness of living with their children. The imprisonment of both Yang Rongli and her husband was a great blow to the two oldsters in the twilight of their life and their health has steadily declined, especially her mother-in-law. Besides suffering from diseases that have lasted for many years, their imprisonment was a great psychological blow to her, and she has been bedridden for a long time in a nearly vegetative state. The two elderly people have suffered so much for the sake of the Lord, they will be remembered by God in heaven. After the Golden Lampstand fell into the hands of the government, Brother Yang Xuan and Sister Yang Caizhen (photos above) were illegally detained and the husband and the wife were both imprisoned. 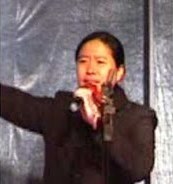 Sister Yang Caizhen became critically ill in the labor camp and almost died there. While critically ill, she was brutally abandoned by the labor camp and was healed by God's mercy. At that time, because the Golden Lampstand Church was sealed up, she couldn't get anything from her home on the church property (whether it was robbed clean or whether a few items remain is not known). Left with no alternatives, she has had to depend on the help from relatives and friends and lived in a basement. Later, a sister in the church let her stay at their place, but then the sister was intimidated by the Public Security so Yang Caizhen was once again forced into a life adrift. Recently, Brother Yang Xuan was released after he finished serving his sentence. He is now without any property and has no place to go. The husband and wife depend on each other and their relatives and friends and continue their life of wandering. We beseech you to pay attention to the the harmonious society that you promote and urge the relevant authorities to resolve this issue of ours.